...and many more to count. What’s more, paperless businesses have the added satisfaction of knowing they’re doing something good for the environment. What’s not to love about that? 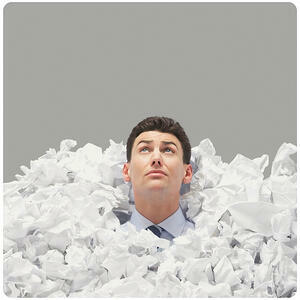 If you’re a pool, spa or hearth business, the advantages of being paperless increases tenfold. Pool, spa and hearth businesses generally have to deal with a tremendous amount of paperwork -- invoices, tech notes, service orders, recording inventory movement, managing vendor transactions, and more. Becoming paperless allows pool, spa and hearth businesses to focus on getting work done while increasing overall efficiency. One of the most apparent ways Evosus can help your business go paperless is through our Sendgrid integration, which allows dealers to mass-email customer documents securely and safely. Say goodbye to manually printing, labeling, and mailing thousands of invoices or customer statements -- with our Sendgrid integration, businesses can send invoices at the click of a button. Tired of phone calls, faxes, and the back-and-forth that comes with order processing? Is your desk covered in sticky notes? Are you tired of walking around the office delivering print outs to the next employee in the process? Let us introduce you to order queues. In Evosus, order queues are an organized To Do list for order processing. Order queues are used to capture and manage orders based on specific data. Every piece of information you need to move along a transaction can be controlled and recorded within an order queue -- replacing the need for sticky notes. Best of all, Order Queues are customizable to your specific needs. Want to create a color coding system within the queue? You can! Do you need a queue that captures any orders that have no scheduled task date yet? Easy. Watch our webinar schedule to register for the next Order Queues training! Every year, pool, spa and hearth businesses face what they dread most: physical counts. The process of counting inventory can be a long, painstaking process that generally involves closing down shop for a day or more and having to count every piece of stock using printed itemized lists manually. The tediousness of having to count hundreds of items one-by-one means that your bored, tired employees can make mistakes or even cut corners, leading to inaccurate numbers and data. After all, it’s difficult to keep track of what number you’re on -- especially when the items in question all look the same. Fortunately, there’s a solution: inventory scanners. With our supported inventory count memory scanner, the Koamtac 350-348052, employees can easily record inventory with just a click of a button. No need to mentally keep track of numbers or write anything down -- the barcode scanner will record each item scanned and input all the data into an Excel spreadsheet, which you can then send to your computer. This method reduces human error and cuts time in half, allowing businesses to get through physical counts that much faster. No printed lists, no clipboards, no stacks of paper. Contact us today to get one ordered! If you’re an Evosus client with a TSYS merchant account, there’s another way you can take invoicing and payment processing to the next level and reduce paper consumption: online bill pay. With online bill pay, businesses can add a Pay Now button anywhere on their website -- in the top menu, in the footer, on the front page -- that allows customers to pay invoices online. Use the the Evosus Sendgrid integration to send invoices via email to your customer and include instructions for them on how to pay their invoice with your website! The idea of going paperless can be scary to many businesses -- moving away from what’s known and familiar, the prospect of having to digitize documents, the idea of having to train employees and customers, and so on. However, we’ve yet to see a business that regrets doing so. Going paperless not only reduces a business’s environmental impact but it saves money, increases productivity, saves space, keeps personal information more secure, and makes sharing documentation much more manageable. Contact your Client Success Manager today to learn how your business can go paperless.